(Newser) – Young boys tend not to forget fantastical stories told by their grandpas, especially if those stories involve downed World War II fighter planes. Klaus Kristiansen of Denmark apparently couldn't get the tale his own grandfather had told him out of his head—that an aircraft had crashed behind their Birkelse farm in 1944—and so when his son had a history homework assignment, he jokingly told the boy to "go out and find the plane that is supposed to have crashed," reports DR P4 Nordjylland, via the Local. But what 14-year-old Daniel Rom Kristiansen turned up in a nearby field was no joke: the remnants of a German Messerschmitt plane, as well as the remains of its pilot, the BBC reports. Why do they keep calling these planes BF 109S? That was a designation for the plane's point of manufacture used by the German Air Ministry primarily for production data. It was known militarily as the ME 109. 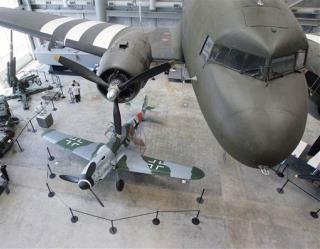 And the photo is of an ME 262, not 109. I hope there are still members of the pilot's family alive to put their relative to rest. I would like to know what consumer metal detector on the market today, can find anything 13 feet below the surface. I have had many, and the farthest down I have ever been able to scan is about 2 feet, max.